For iCalculate (Maths) some of us thought that we should calculate the goal ratio for every game. For iCreate (art & DT) our group thought that we could either draw a Welsh football kit or a Euro 2016 trophy. For iCompute (ICT) some of us considered the option of programming our own football game /penalty shootout or creating a powerpoint to tell people all about the Euro 2016 tournament. For iThrive we could have our own football match/tournament. For iDiscover we would have a lesson on which bones or ligaments of our body we use when play football or how much force will we need to kick a ball from a certain distance. For iThink we think our lesson should be on the history of football itself or we could learn about the timeline of Wales’ football events. To show the school what we’ve done, we decided that we were going to put some of our work in the newsletter, on display boards and make our own pic collage. 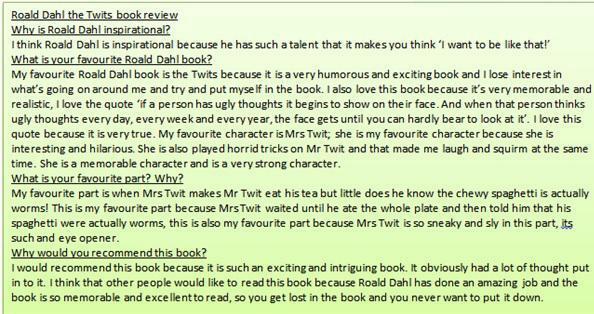 We also thought it would be a good idea to share our work here on our school website. 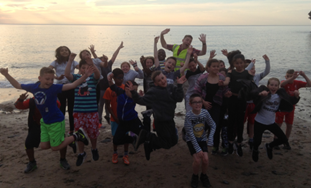 On Sunday 24th May year 6 pupils went to Llangrannog in West Wales for an adventure packed residential trip. The children stayed at Gwersyll yr Urdd (Urdd Campsite) which is ran by Urdd Gobaith Cymru (The Welsh League of Youth) -an organisation that promotes the use of the Welsh Language whilst providing children with the opportunities to do adventurous activities that challenges their nerve, builds confidence and gives them opportunities to learn independency. 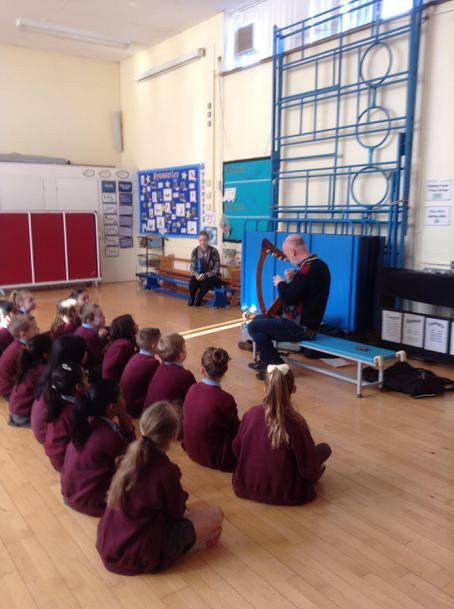 The children were accompanied by students from our cluster primary schools . This gave the pupils a chance to meet their future class mates as they prepare for the transition to High School. The residential began with a walk to Llangrannog village where the children spent time on the beach. 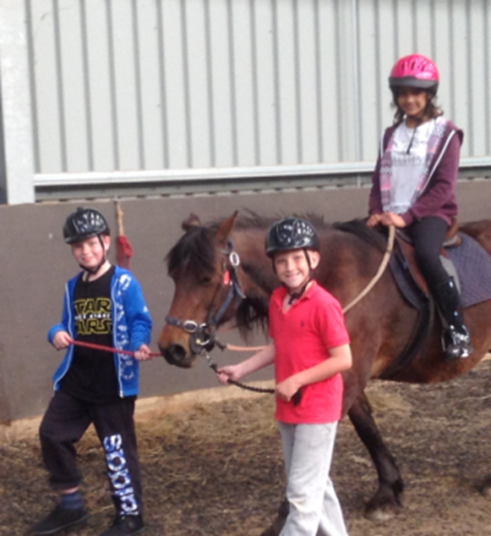 The activities on the camp included, skiing, tobogganing, archery, trampolining, horse riding, high ropes, go carting, quad biking, low ropes, rock climbing and swimming in the onsite pool. 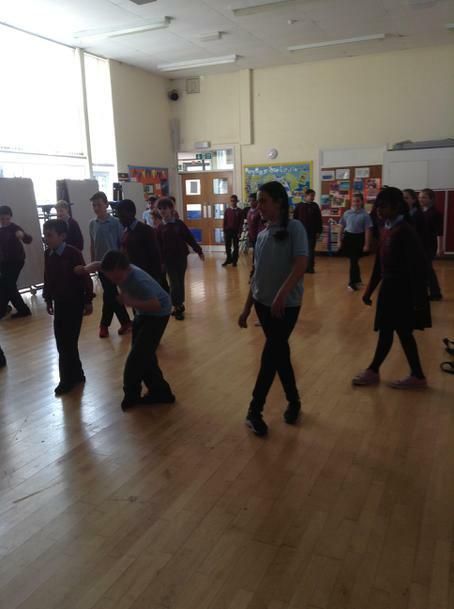 The evening activities included a Twmpath and a disco where the children impressed us with the way they interacted with other schools and made friends with other children in preparation for September. 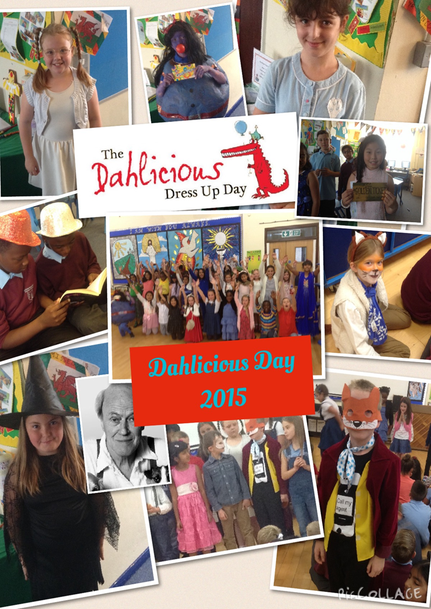 The children had a fantastic weekend and were a credit to the school in their behaviour and attitude. 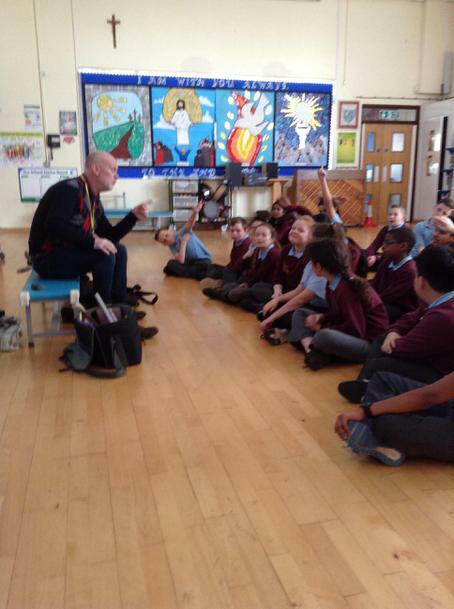 This week the children in 5/6 have been lucky enough to visit Cardiff Museum and meet the famous author Tony Bradman. 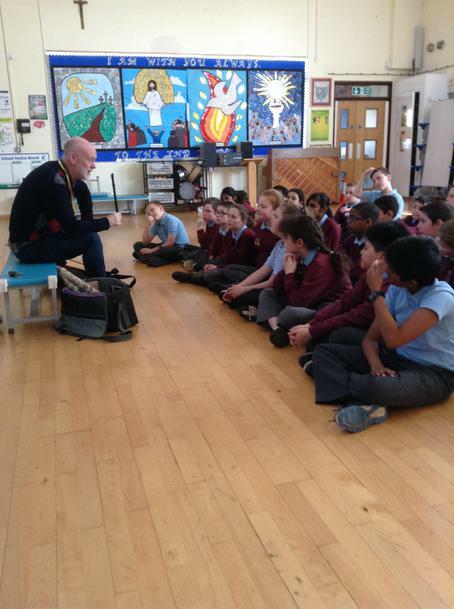 He shared with us his knowledge on William Shakespeare and we had a fantastic sneak peak into his new book, 'The Boy and the Globe.' What a fantastic experience! 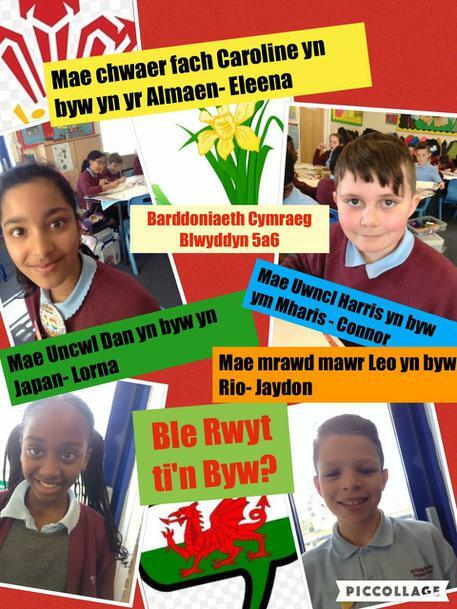 This week in Years 5 and 6 we have been using our reasoning skills to solve a problem posed to us via a video message from The First Minister of Wales –Rt Hon Carwyn Jones. The problem was about which energy source would be best for each region. We had four regions which were North West Wales, North East Wales, South East Wales, South West Wales; we had to find out the best possible fit for each region. We had a number of factors to consider. Which power stations produce enough energy? Can the region afford it? Will it be built in time? 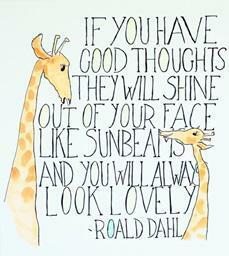 We think the best solution for North West Wales would be Solar Power. This is because the region can afford it as our budget is £140 million and the solar power plant costs £100 million. The area of solar power is 55km and the area available is 6km x 10km which equals 60km. Also, the solar power plant needs to be built within 26 months (2 years and 2 months) and the solar power plant only takes 2 years to build. It needs to able to power 200,000 households and solar power can power the exact amount. In addition solar power would be perfect for North West Wales. The best solution for South East Wales is a coal power plant. We think this because the South East Wales region needs to produce energy for 500,000 households also our budget is only £250 million and the coal power plant only costs £200 million. This will fit perfectly because the area available is 20km x 20km which equals 400km2 which also is the amount of area the coal plant takes up. The only problem is that coal produces a large amount of CO2. In addition, a coal plant would be perfect as the region can afford it and you would also have £50 million left over. The best solution for South West Wales would be wind power. We think this is the solution because although there is not enough energy to power all the households it is a best fit. It also is in the budget (120 million) also, the area also fits well because the area given is 90km and 60x6=360km so we have enough space. The wind farm takes 1 year to build which is perfect because the power plant needs to be built within 12 months (a year). In addition, wind power would be the best solution for South West Wales as the region will be able to afford it. 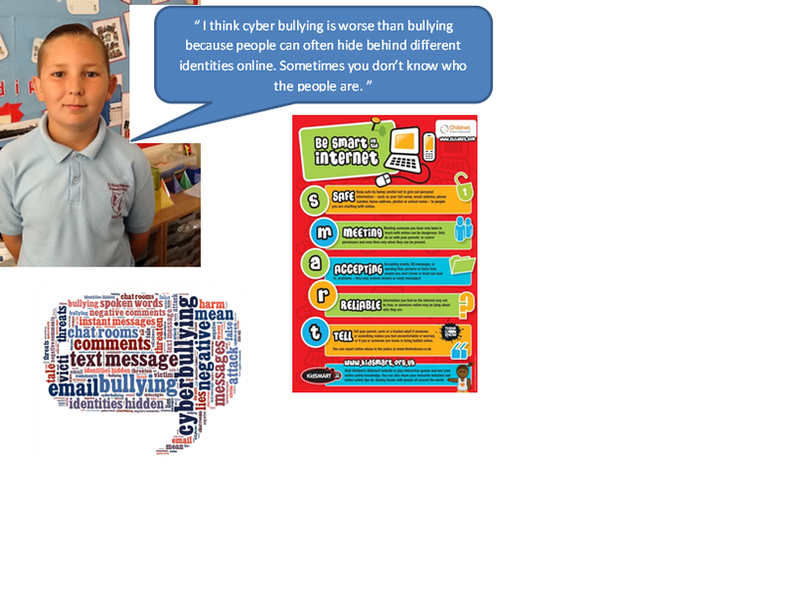 This week we have been learning about e-safety but we have especially been thinking about being SMART on the internet. We have learnt that you should think carefully about what you say before you post something online and never give out passwords. E-safety aims to equip people with the understanding, knowledge and skills to use information and communication technology creatively and purposefully. Online technologies play a huge role in our lives so providing E-safety knowledge is vital to ensuring everybody uses the internet safely and positively. As part of our learning during Esafety Week we made imovies to share the key messages of how to stay safe on line. 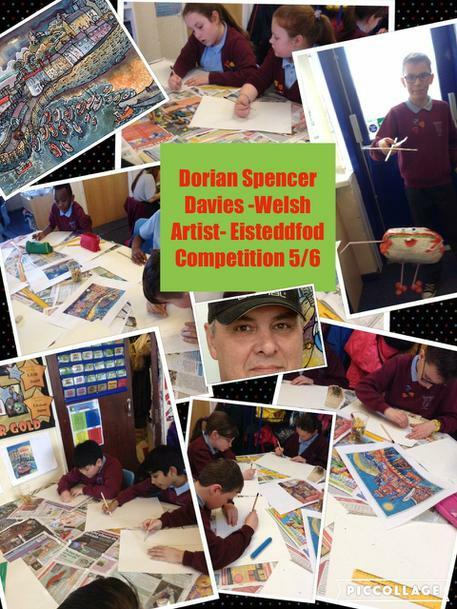 In Years 5 and 6 we have been preparing for St. David's Day and our school's eisteddfod. This week we have started our Cluster Schools Transition project. 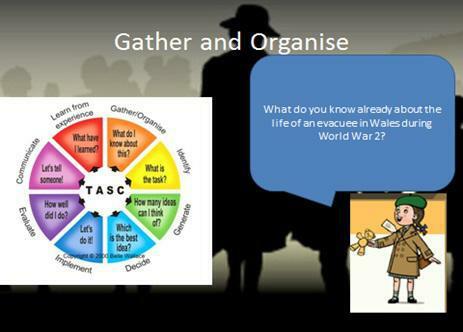 Mr Griffiths and Mrs Davies have been working with other teachers across to plan and resources and mini context that will be under taken by all year 6 pupils. The work will then be shared with their High School teachers to help them have a deeper understanding of the children’s abilities and potential. The project is called Let’s Fly and is based around the theme of flight. 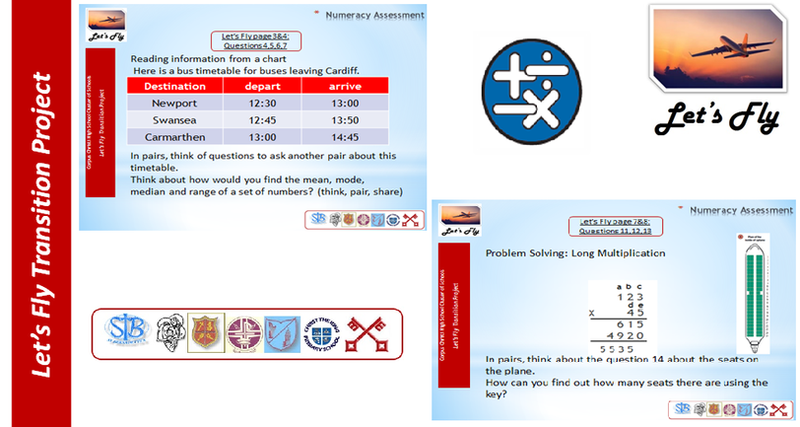 We began by carrying a numeracy investigation in which the children use their maths skills to solve problems that they might face in real life in an airport when flying to another country. The children are also developing their literacy skills of reading, oracy and writing through exploring the history through the biographies of key figures such as Emelia Earhart and the Wright Brothers. The children had to set their partners a challenge and write a variety of statements. Some which were true and some which are false. The children had to carefully read the text to correctly place the statements. Amelia Earhart was born on July 24, 1897 in Atchison, Kansas. Her father, Edwin, was a lawyer who worked for the railroad. She spent a lot of her childhood playing with her younger sister Muriel. Growing up Amelia and her sister had all sorts of adventures. They collected insects and frogs. They liked to play sports including baseball and football. In 5/6G last week we celebrated and shared our current ‘Come and See’ topic, ‘Sources’ through our class act of worship. The focus of our act of worship was the importance of scripture and how the words of the Bible influence our lives. 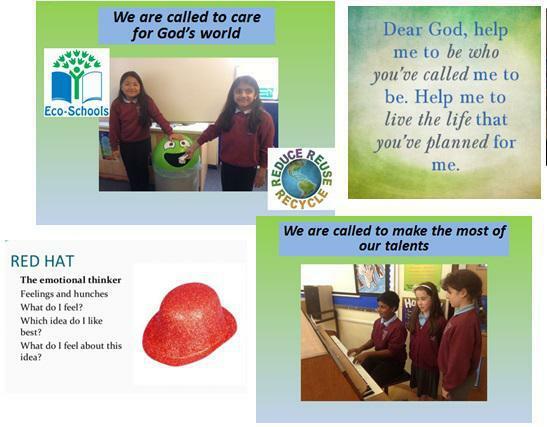 We thought particularly carefully about how we live our school mission statement. It is also important that, as Christians, we know our story, where we have come from and where we are called to go. We know we share in the story of those who have gone before us. For Christians, the Bible is a guide for living. Through the Bible, Christians begin to know more about God, Father, Son and Holy Spirit and try to discover how we should live our lives. We wrote our own prayers praising God and thanking him for the most important book of all- The Bible. Our prayers reflect on how the Bible brings us into the presence of God. It is God who speaks through the words of Scripture. Through Scripture, we are given strength and courage in our lives, not only to hear the Word of God, but to put it in action in our lives. Electricity can be generated using coal, gas, nuclear fuels, the wind or sunlight. Electricity is generated in power stations. Some ways of generating electricity, like burning gas and coal, create greenhouse gases. This then cause climate change. People are trying to make more of our electricity in ways that are good for the environment, like using wind power or solar power. It’s important only to use electricity when we need to, and to save what we can in order to save our planet. Electricity first came into widespread use in the Victorian era, when people started to use it to light streets, shops and homes. A bolt of lightning is electricity travelling from the clouds to the ground, or from cloud to cloud. With small solar panels and wind turbines, it’s even possible to generate some electricity at your home or school instead of at a power station. Wind power generates electricity by using the wind to turn the big arms on a wind turbine. Solar power generates electricity by absorbing the heat and light from the sun in special panels. On our trip to Aberthaw Power Station, I enjoyed the part when we were making the wind turbine. It was challenging but we persevered, and we did it. I learnt that 1.4 million tonnes of coal is only enough to generate electricity for 3 months. 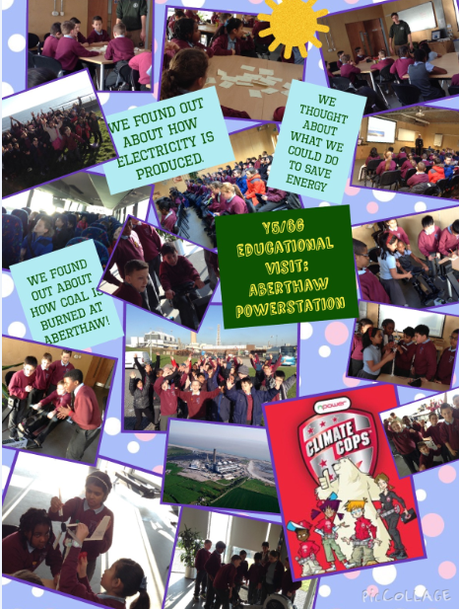 On our trip to Aberthaw Power Station, I enjoyed the part when we generated electricity and pulled the row machine , I made 62 watts . I leaned that coal isn’t the only source that can be made into electricity, there is , water , hydro , mechanical , wind and lightening. I also enjoyed the tour of the power station. We will be carrying out a reasoning investigation back in class to determine which energy source is the most efficient in terms of cost, cleanliness and man power. Following this we had a look at how different energy sources are used to supply the national grid. We also analysed data to identify at which times in the day the National Grid needed to supply the most electricity. After that we looked at how hard it is to make electric by having a go on a rowing machine. During our trip to Aberthaw power station ,I enjoyed the part when we had to make our own electricity using aa rowing machine. I scored 38 watts. I learned that that they had 3 low pressure turbines . 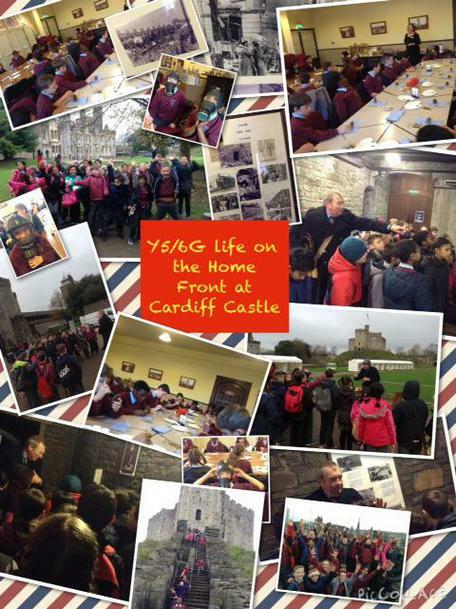 Y6G: Educational visit to Cardiff Castle: Life on the Home Front. 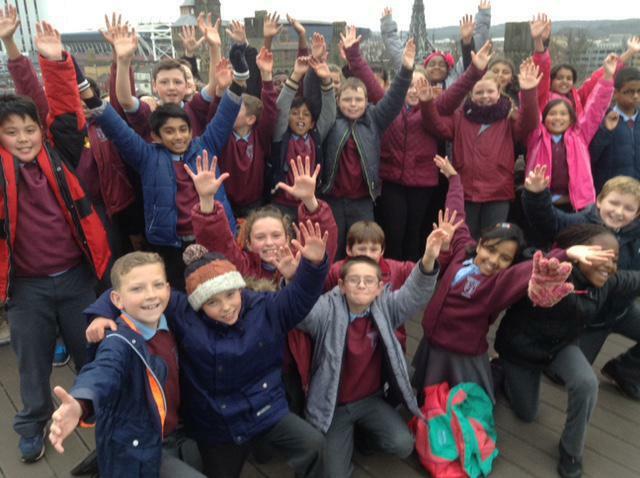 Last Thursday our class too part in a Life on the Homefront workshop at Cardiff Castle. Here’s Rena’s recount of the day. 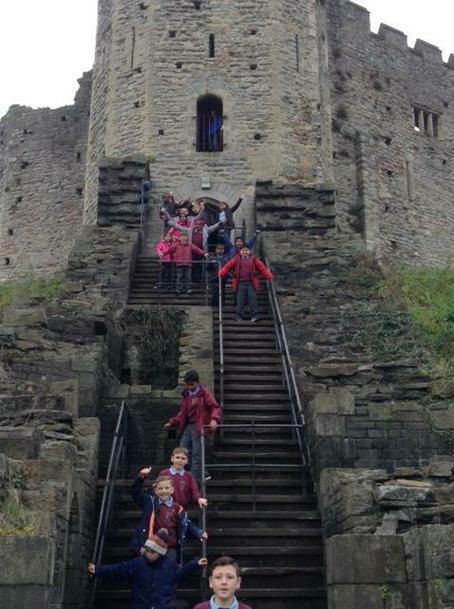 On Thursday 26th November Years 5 and 6 went to Cardiff Castle. This linked to our topic The Blitz, Life in Wales during World War II. 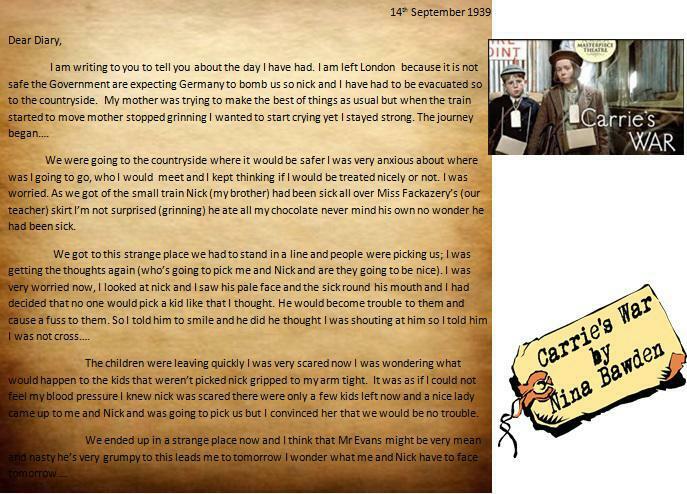 We took part in 3 activities that helped us to find out more about the lives of people in Cardiff during the War. To help us understand what it was like for children during World War II we took part in a workshop in which we made Christmas decorations like children did in Cardiff during the War. Because so many things were rationed people couldn’t go out and buy Christmas decorations as such people had to make their own. Subsequently, we painted fur cones with white paint to be used as Christmas tree decorations. In addition to this, we made paper chains from recycled paper. These would have been used to decorate homes. We all agreed that they weren’t as attractive as decorations we have now. We also looked at photos of school children in Cardiff during the War. Finally, we went on a tour around the castle and whilst at the top of the castle’s keep we spotted places that were bombed during the War. From the top of the keep’s tower you can look out over the skyline of Cardiff. We had to find the areas (such as the Bay and Llandaff Cathedral) that were badly bombed during the war. We looked at where there are new buildings and old buildings that had existed before the war and this showed us where areas were badly bombed. We all really enjoyed our visit to Cardiff Castle and learnt so much more about the Blitz but in particular I will always remember finding more about the lives of people in my home town during the war as I hadn’t realised that so many bombs had been dropped or that so many people died in our city. Y5/6G Computing: Excellent Educators- Creating a video tutorial. 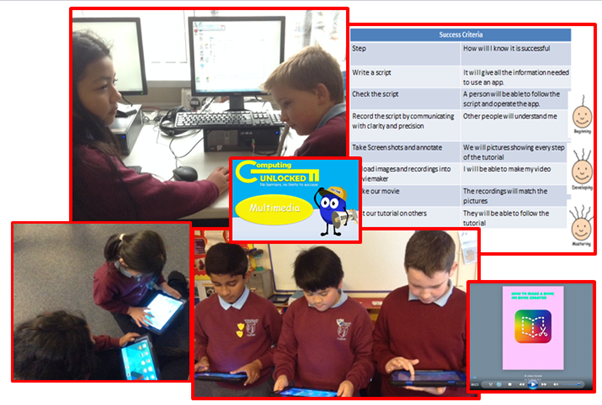 This term in our computing lessons we have been learning to use multimedia software. Our task was to create a video tutorial to teach younger children how to use an iPad app. We began the topic by viewing an existing video tutorial on YouTube. We discussed its strengths and weaknesses and used it to generate a class success criteria. We used this to identify s the steps that we should follow to successfully create our own video tutorials. We worked hard to think about what the step would be like when it was successful. Our first step was to write a script that we would record and add to the video. When we had written our scripts we tested its effectiveness by reading out the script and following the steps on an iPad. Following this we took screen shots of the different steps. We uploaded the pictures onto a computer and annotated the pictures by adding words and keys to point out what to do. We used Microsoft Movie Maker to create our videos. We uploaded the photos that we had edited. We recorded our scripts using Microsoft Voice Recorder and added the recordings to our videos. As part of our Context for Learning: The Blitz in Wales we have been thinking about life during World War 2 on the Home Front. 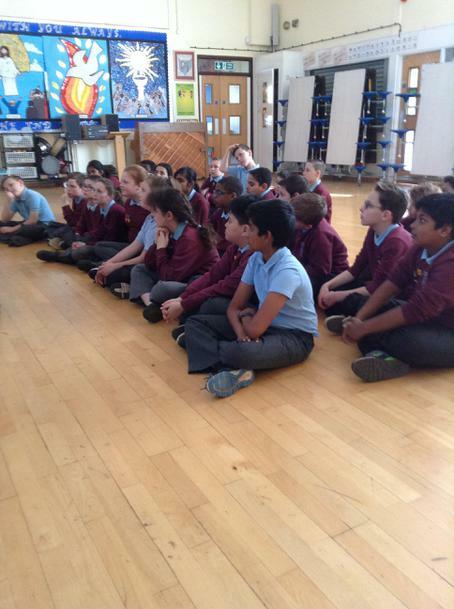 Jessica reported, “We have been finding out about what people had to do help the war effort at home. 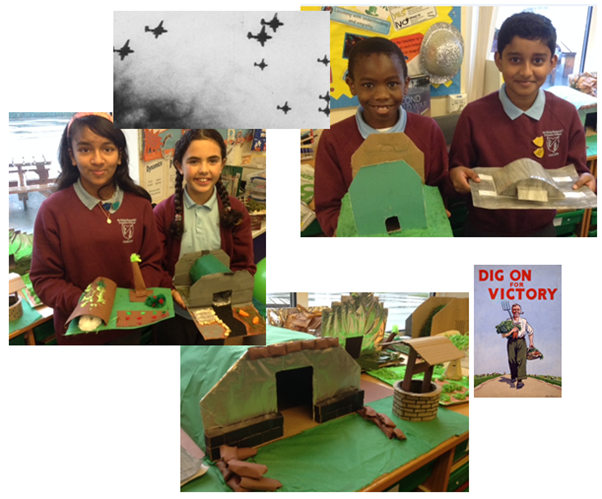 We found out that alongside rationing people had to do a lot of special things including growing vegetables as well as making their own air raid shelters in their gardens.” In our DT learning we are looking at making shelters and constructing model Anderson Shelters. Over half term we were set the homework task to make our own models. Here are some of our amazing constructions! 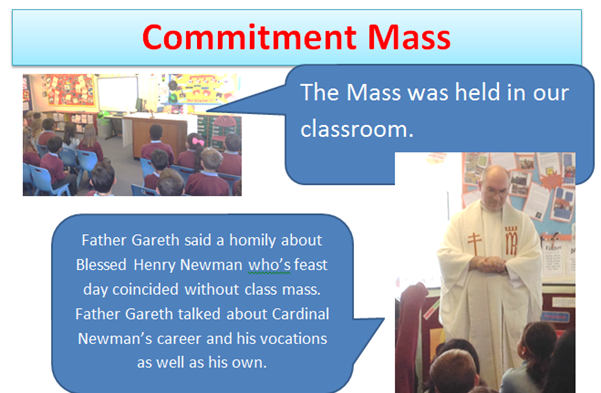 Last Friday Father Gareth celebrated mass in our classroom and the intention was: for those called to the Priesthood and the Religious life as well as our vocations to serve others. We choose readings from scripture that linked to our RE topic and wrote bidding prayers linked to the mass intention we also choose hymns that linked to the mass theme. 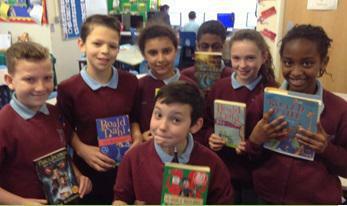 Y5/6G English: Changing a text into the third person. Our current class novel this term is Carrie’s War by Nina Bowden which links to our context for learning The Blitz as it focuses on the life of Carrie a girl evacuated from London to Wales during the World War II. 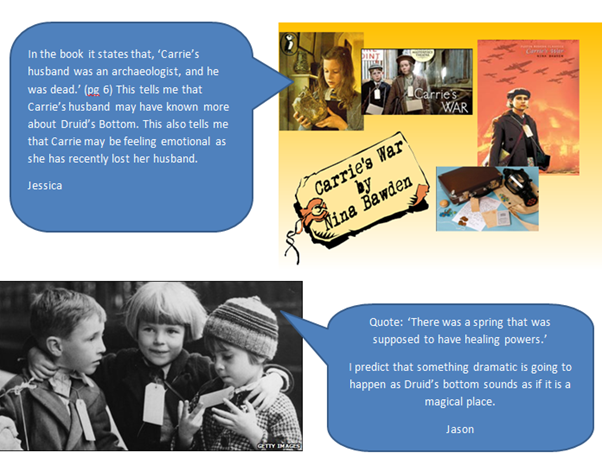 This week we have been looking at the section of novel in which Carrie is billeted to the Evans family. 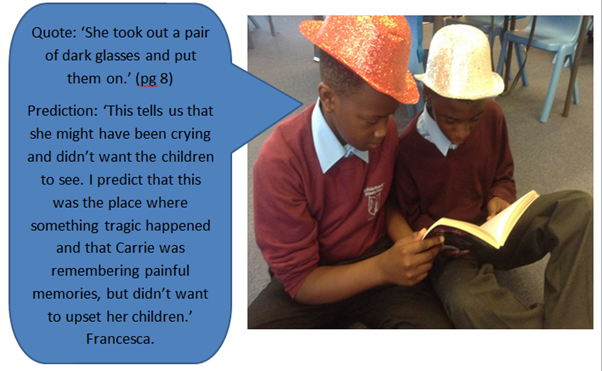 We have been putting on our red thinking hats to help us understand the thoughts and feelings of the characters. This has helped us to understand what it was like for children being evacuated to Wales as well as helping us develop our writing skills. This week we focused on changing the voice of the text. Nina Bowden wrote the novel in the third person but we looked at rewriting scenes in the first person. To help us we hot seated the characters and prepared answers which helped us to see things from their point of view. We then utilised our knowledge of life in World War II to add extra details and events to our writing. Here’s Mason’s Diary entry for Carrie. In years 5 and 6 this week we have been retelling the traditional Welsh tale Bloduewedd, the fourth branch of y Mabinogi. 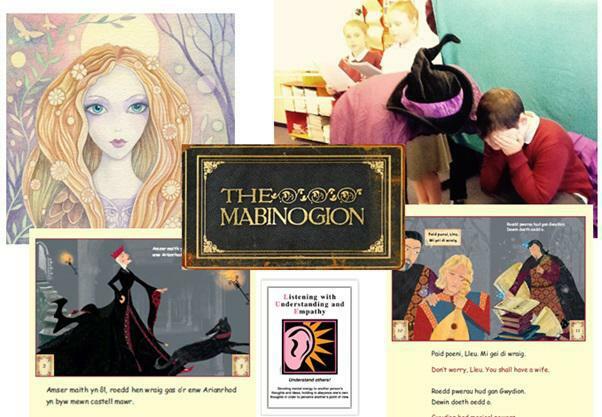 The four branches of the Mabinogi are famous Welsh stories that have been told for centuries, passed down from generation to generation, and are widely regarded as the finest example of traditional Welsh storytelling. They are stories of heroism and heartbreak, love and disloyalty, and are set in a mythical landscape which corresponds to many places that can still be seen in Wales today. We read a simple version of Bloduwedd. Each group were then allocated a scene in the story. 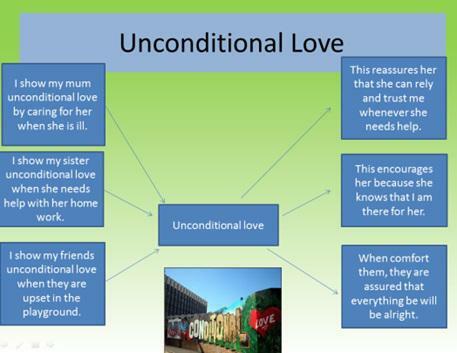 The children had 15 minutes to think interdependently. 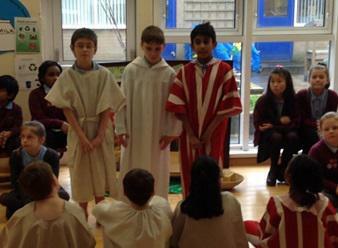 Each child was given a specific character or role. The Big Boss was the director. We all used the Habit of Mind, ‘Listening and Understanding with Empathy’ to truly understand the actions, thoughts and feelings of each character. 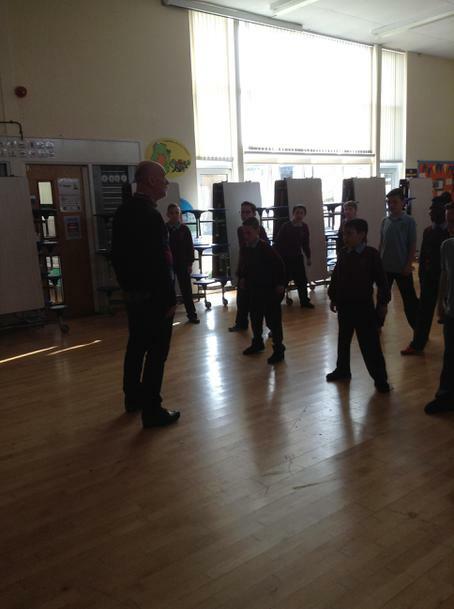 Each group had to perform their scene to the rest of the class. On Friday September 25th September the children and staff at St Philip Evans Primary School celebrated their 40th anniversary Mass. 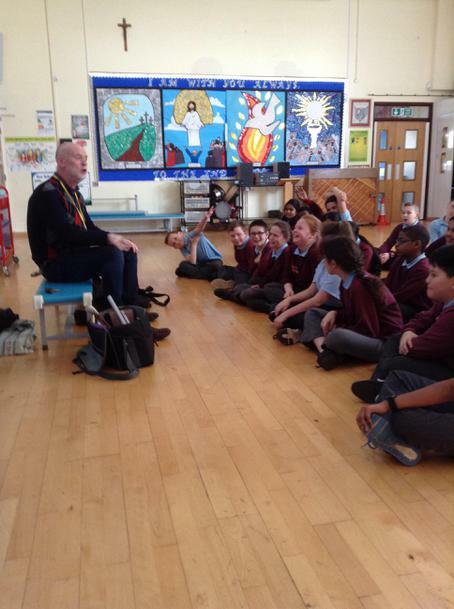 We are very grateful to Father Gareth who celebrated the special mass with us. We began our mass with our ‘Gather’. The children sang the Zimbabwean hymn, ’Come all you People.’ It was a wonderful way to gather as a school community and mark the successes of the school over the last 40 years. 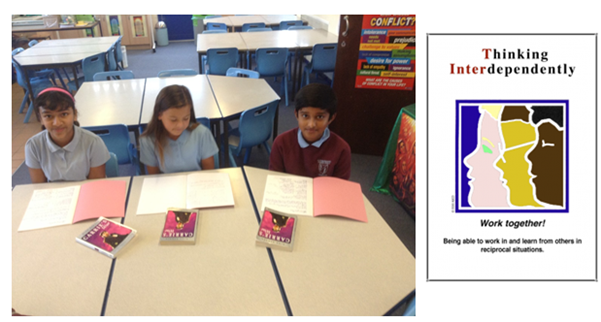 Our Head boy and girl and our Deputy Head boy and girl read our introduction. They set the precedent and were true role models as they used the Habit of Mind, ‘Communicating with Clarity and Precision.’ They gave us time to reflect on the achievements of the school and reminded us of the incredible community St Philip Evans has been a part of since 1975, and continues to be a part of today. Our readings reminded us of the importance of treating others the way we want to be treated ourselves. Our school has grown in faith and love, and we recalled how Christ has always been at the centre of our school community. Love one another just as I love you. The greatest love a person can have for his friends is to give his life for them. And you are my friends if you do what I command you. I do not call you servants any longer, because servants do not know what their master is doing. Our prayers of intercession focussed on the church and her mission to live and share the Gospel of love. We prayed for an end to injustice, violence and fear in our world. We asked that governments and leaders work tirelessly for peace and equality so that all people can enjoy the happiness they deserve. We prayed that we will be encouraged and inspired by the lives of the Saints especially St. Philip Evans and all who dedicate their lives to sharing and living the gospel of love. 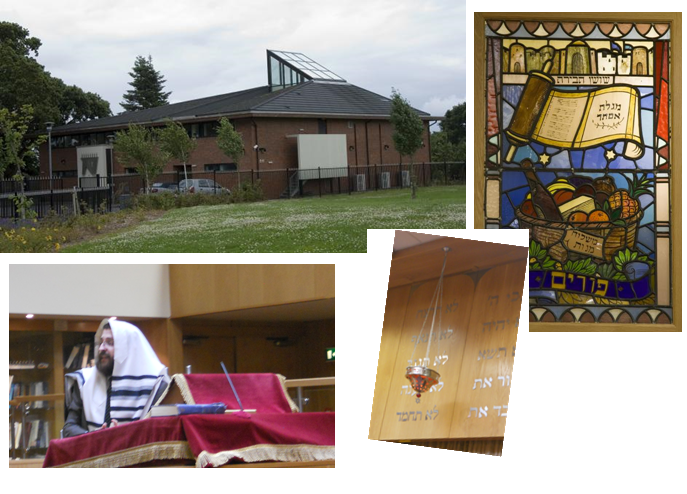 We prayed for all pupils, parents and staff, both past and present that they will open our hearts and minds to the Word of God, and make time in our busy lives to hear his voice as he speaks to us. We prayed for ourselves as we journey from childhood to adulthood; that we may have the courage to face the new challenges that we meet along the way, and the strength and faith to stay close to God’s love. We prayed for all past staff, governors, parents and pupils of St Philip Evans who have died in the peace of Christ; that they will enjoy the happiness of eternal life with God in his heavenly kingdom. 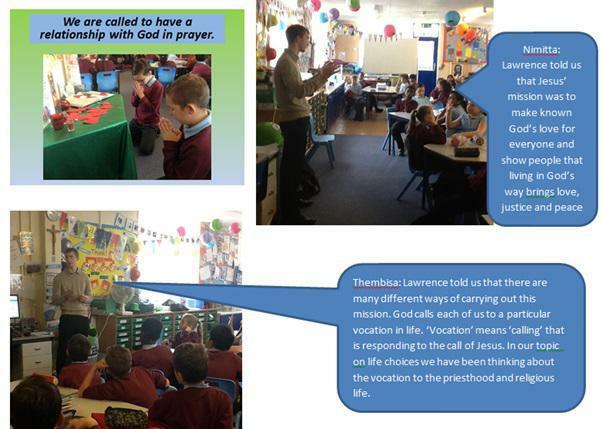 This week in 5/6D we celebrated our class assembly linked to our current ‘Come and See’ topic, ‘Commitment and Vocation.’ We were very lucky in our class to have had a visit from Lawrence Bryce who is a seminarian from the Cardiff Archdiocese who is currently based in St. Philip Evans Parish. A seminarian means Lawrence is training to be a priest. Lawrence told us about how through the sacrament of baptism all Christians are called to share in the mission of Jesus. In our reflection we thought about how we are called by God to follow is Jesus’ footsteps and how we should live our lives as Christians. This term we are investigating the properties of different materials. We have looked at changes that different materials go through and learning about how the changes are reversible or irreversible. We have been thinking about how some materials are soluble and can be dissolved into liquids. We have carried out a number of different investigations to find out more about how different materials dissolve. I predict that the icing sugar will dissolve in the least amount of water because the icing sugar has the smallest particles. I know this because the smaller the particles the less amount of water will be needed to dissolve. Whereas, I predict that the granulated sugar will dissolve in the most amount of water. 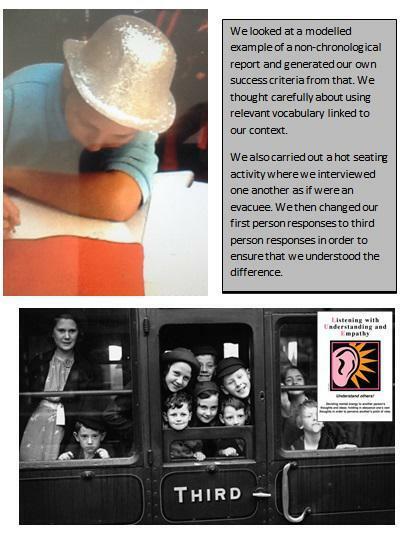 In years 5 and 6 we have been using the Habit of Mind, ‘Listening and Understanding with empathy’, to write a report about life in Wales as an evacuee. 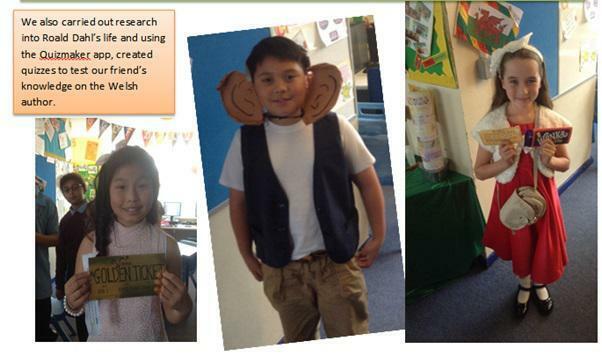 We carried out research as part of our Learning Log homework. We then categorised our information using a tree map. We discussed relevant subheadings for each section of our report. When the children were being evacuated they didn’t even know what was happening. About 800,000 children were evacuated, but that was only the first group of children. There were many more to be evacuated over the years. When the children arrived at their destination the Billeting Officer would take them into a hall and they would stand in a line and wait for people to pick them. These people were called Host Families. Every morning since they were in the countryside they would start the morning with a walk. Some children were treated badly and they missed their homes so much. The only way they could communicate was by writing letters. 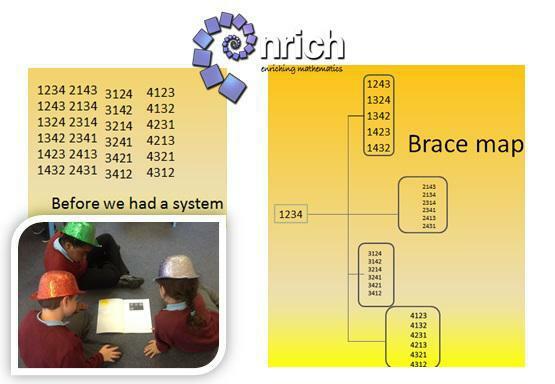 This week have been using our learning about place value to carry out an reasoning investigation that came from the website Nrich. 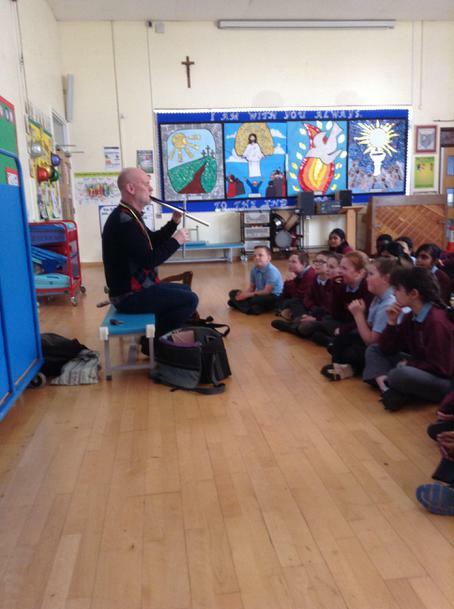 The children were able to answer a number of questions and had excellent prior knowledge. We then held a mock trial, where the children were allocated different parts and had to decide whether the defendant was guilty or innocent.  What are some of them?  Are some unnecessary? Why?  What happens if they are broken?  Who controls the game?  What does that person need to know?  What could happen if there are not rules?  What happens if rules are broken?  Who decided upon the game’s rules?  What happens if you break them?  Which was the more serious?  How does the victim feel? 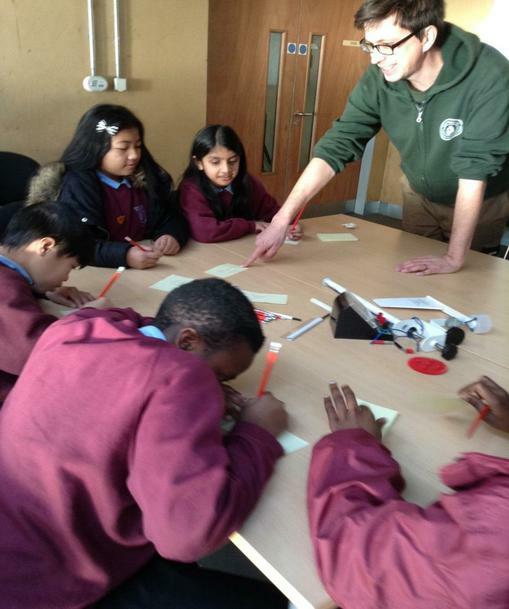 Participation in a Thinking Skills Programme for rehabilitation purposes. We are now going to be using what we have learnt to write a balanced argument, before individually deciding on a verdict and sentencing. 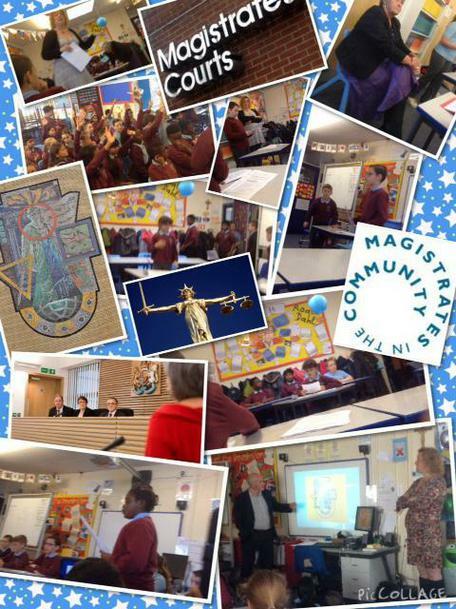 What a fantastic experience, where we learnt an incredible amount of new information about the British Legal System. 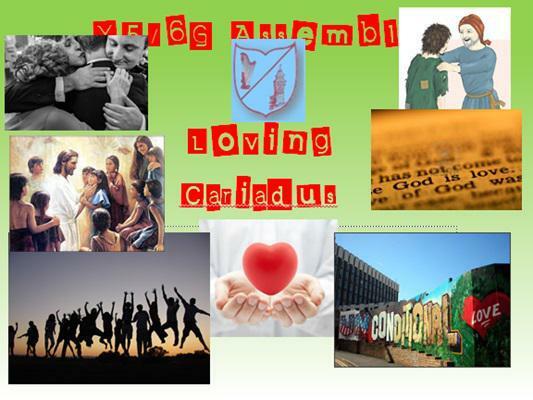 Our current RE Come and See topic is entitled loving or cariadus in Welsh. 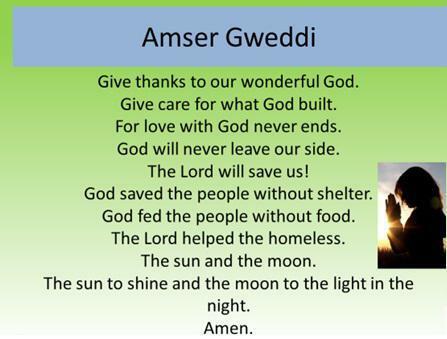 To begin our assembly we sang , “I will come to you in the darkness” we chose this hymn as it reminds us of God’s love for us during the darkest moments of our lives. After the gospel reading a number of us acted out the parable of the Prodigal Son Jesus often used parables to help people understand his teaching. Parables are stories with a deep meaning. Jesus used the story of the prodigal son as a way to help us understand God’s unconditional love. 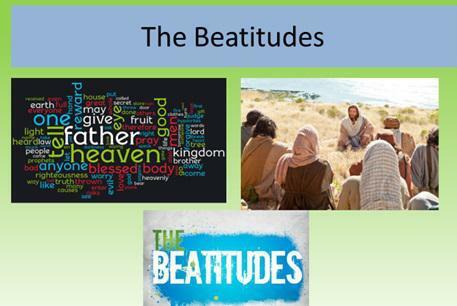 After the dramatization of the Prodigal Son the class shared the Beatitudes which are more teachings of Jesus about how we should live our life. 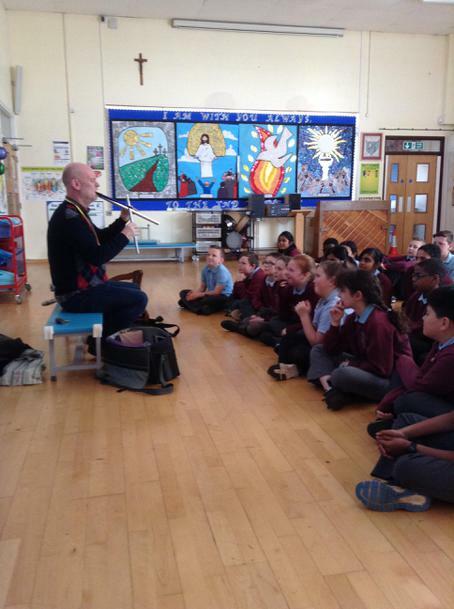 The children shared the different verses and explained how the other children could let these shape their lives. RE lesson based up upon psalm 136. 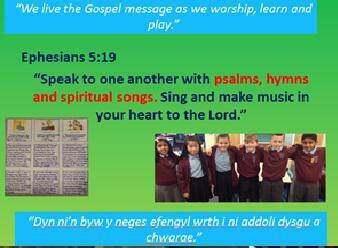 Then we lead the school through prayers of intercession answering in Welsh. 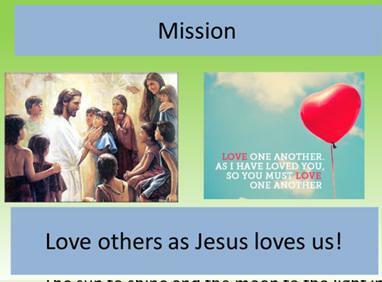 We challenge the school t leave our assembly with the mission of loving others as Jesus’ loves us. To finish we sang our favourite hymn Here I am to Worship. At the start of the term we started our class novel for the term Carrie’s War which links to our context for learning about the Blitz and the life of evacuees in Wales during World War II. We have finished the first chapter and thought carefully about the information that we can infer about the characters and used this information to make predictions about the rest of the story. Inference is the reading skill of make decisions from a text by reading between the lines. The first chapter gave us a number of clues linked to what was going to happen in the rest of the book. We used the habit of mind ‘Listening and Understanding with empathy.’ to put ourselves in Carrie’s shoes. We analysed the text and thought carefully about how the author was giving us more information about the characters.